I relaxed the night before telling myself that it would be ok not get up at 3.25am. Just for the sake of getting up that early would not be worth failing to have my crucial 6 hours of sleep. Starting the day a bit later (with more daylight) would be worth having more sleep. This was a personal struggle I had when I was in the habit of getting up at 3.25am. At that time it is calm and dark outside, perfect for walking and writing. I had to negotiate with myself that breaking the habit would be ok. Out of this negotiation, the following thought sequence happened. 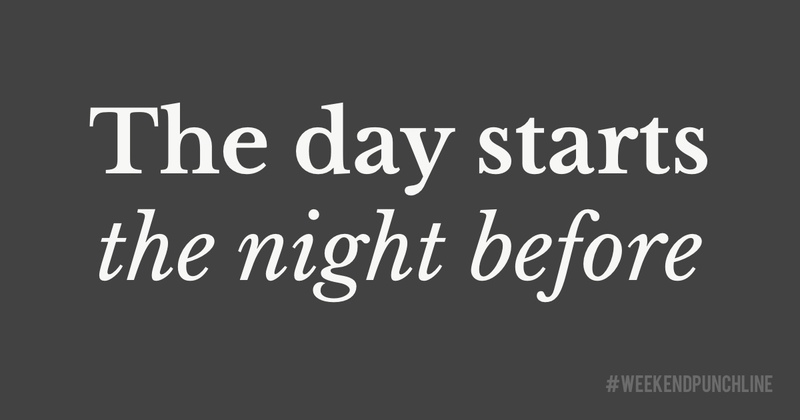 Always keep in mind that the next day starts the night before. Your night sleep is actually how you will start the day though you can easily assume that when you get up it is when your day starts. It totally makes sense and is common sense. But you neglect the fact that your prior action and activities are always setting the foundation for what comes after. So, you could even say that how you spent your day will set the stage for how you go to bed and accordingly how you will spend the next day. Let us go crazy and reverse that to the beginning, at least the beginning of your existence. How you were nourished, treated, caressed and taken care of when you were some kind of an existence in the belly of your mom (unless you were an alien child like Dana Scully’s ^^), all that influenced what can kind of person will be born. Yes, there is DNA, genes, and biology but there is also context and environment. Drug dealers are not born as drug dealers. Musicians are not born as musicians and people inspiring others are not born as wunderkinder. All of that pretext to say: I went to bed late last night, decided that getting up at 3.25am (my new standard waking time) would be crazy when there were only 3.75 hours of sleep and agreed with myself that it is more important to get that round about 6 hours of sleep and start the day „late“ rather than sticking to my routine-waking time, being a morning zombie, super sleepy and actually only longing to sleep more during the whole day. I would do myself a disservice. So, I served myself a good sleep of 5.75 hours and still followed my morning routine, incl. writing. This morning I actually wrote more than 2.4K words. All because I calmed down the night before, agreed on how I would want to get up and prepared myself for the day to come. Preparing the day takes longer compared to just starting the day like that (with no intention) but that is like baking a cake with the ingredients you have in the house and bake whatever rather than buying the ingredients and make up your mind before. The result is simply light years ahead. Ultimately it is your decision on how you want to spend your day. I started to differentiate between a business (part of my) day and artist (part of my) day. On a business day or on the business part of it I take targeted actions. In the artist time I do free play, this is usually on the weekend or in a sabbatical. This was episode 38 of the #weekendpunchline . Every Saturday and Sunday.